In 1926 Roald Amundsen, Lincoln Ellsworth and Umberto Nobile flew with 13 others in the airship Norge from Ny-Ålesund at Svalbard over the North Pole to Teller in Alaska. Theirs was the first undisputed crossing of the North Pole by air. It was also the most intensely photographed of polar expeditions, with movie cameras taking in the views from the ground and from on board the airship. 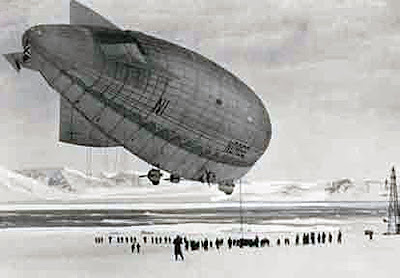 The flight, which originated with airship designer and pilot Nobile in Rome, had been touted as Rome to Nome’ but bad weather forced a landing at the small settlement of Teller just short of Nome. Richard Byrd was encountered en route to and from his subsequently disputed Polar flyover. The Norwegian cameras were there all the way, and all the way home too. Hero’s welcomes await Nobile in Naples and Rome (a medal from Mussolini), and Amundsen, the first person to travel to both poles of the earth, throughout the length of Norway. This visually stunning record has been little seen in the 85 years since it first thrilled adventure-loving audiences. In Wellington this silent 99 minute film will have a live pianist.